A new report finds both educators and pupils are woefully misinformed. Just eight percent of American high school seniors can identify the cause of the Civil War; less than a third (32 percent) know which amendment abolished slavery in the U.S.; and fewer than half (46 percent) know that the "Middle Passage" refers to the harrowing voyage across the Atlantic undertaken by Africans kidnapped for the slave trade. These are only a few of the more unnerving findings from the Southern Poverty Law Center’s Teaching Tolerance project, which concludes that in classrooms across the country, the subject of slavery is as mistaught as it is misunderstood. Drawing from online surveys of 1,000 12th-graders and more than 1,700 social studies teachers, along with an exhaustive analysis of the 10 most widely read U.S. history textbooks, the SPLC's latest report attempts to assess how well the country understands its original sin. In a word, the results are "abysmal." "[Students' misconceptions] extend beyond factual errors to a failure to grasp key concepts underpinning the nature and legacy of slavery," writes Melinda D. Anderson of the Atlantic. "Fewer than one-quarter (22 percent) of participating high-school seniors knew that 'protections for slavery were embedded in [America’s] founding documents'—that rather than a 'peculiar institution' of the South, slavery was a constitutionally enshrined right. And fewer than four in 10 students surveyed (39 percent) understood how slavery 'shaped the fundamental beliefs of Americans about race and whiteness.'" The teachers fared almost as poorly. 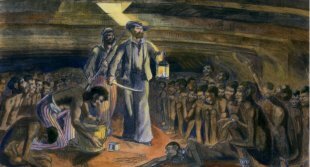 Despite 92 percent claiming that they were "comfortable discussing slavery," most implemented a course of study that could be described as incomplete at best and negligent at worse. Nearly half of the teachers failed to teach their students that protections for slavery were enshrined in the U.S. Constitution, while only a fraction more (54 percent) explored the institution's legacy on American society today. What exactly are they teaching? Incredibly, dozens of teachers rely on "simulations," or role-playing games, which Teaching Tolerance cautions can "do as much harm as good." This method recently incited outrage in Cerritos, California, when instructors bound their students' wrists and made them lie on the floor in the dark as part of a slave-ship reenactment. Meanwhile, the textbooks at their disposal are woefully inadequate, often privileging the stories of abolitionists over the enslaved. The best of these textbooks addressed just 70 percent of the Tolerance Project's key concepts related to the study of American slavery, while the average score was 46 percent. Similarly, the report finds that, "state content standards are timid and fail to set appropriately high expectations." "Taken together, the study exposes a number of unsettling facts about slavery education in U.S. classrooms," continues the Atlantic's Anderson. "Slavery is taught without context, prioritizing 'feel good' stories over harsh realities; slavery is taught as an exclusively southern institution, masking the complicity of northern institutions and citizens in America’s slave-based economy; slavery is rarely connected to white supremacy—the ideology that justified its perpetuation; and slavery is seldom connected to the present, drawing the arc from enslavement to Jim Crow, the civil-rights movement, and the persistence of structural racism." The Teaching Tolerance project outlines a path forward, urging schools to use original historical documents and integrate slavery into the greater study of U.S. history. Only then can we begin to understand how the "present relates to the past." Read the Southern Poverty Law Center's full report.